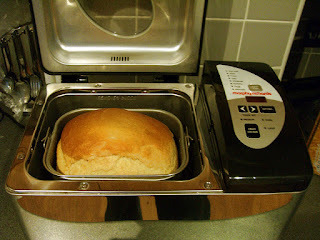 When we were cleaning out our house recently, we found our bread maker. Okay, if you had asked me, I thought that we had given it away years ago. Silent Sam and one of his friends always referred to it as "the plant stand" because they never saw bread come out of it. I hate to admit that they were right but they were. I know that I bought mixes at the grocery store and made bread a few times. It was not enough to justify the expense. So, I was surprised to see it still in the basement. Surprised but I still did not get rid of it. Somehow it made it through that round of purging. Several weeks later, I noticed that Silent Sam was throwing away a loaf of bread that we had bought at the grocery store. We don't buy bread often. We both like bread but feel that we should be more careful and so we rarely buy it. This past winter when we were having our "Sunday night soup nights", we would buy one loaf to go with the soup. We would then have it for several nights with dinner. It seems we did not have the meals with bread as planned and the bread went bad before we could eat it. That is when I had an idea. What about making the bread in the bread machine? Okay, now some of you could be laughing at me but I didn't know if they still sold the mix in the grocery store. I was talking to a friend and asked her if she knew. (She had gotten rid of her "plant stand".) She then told me that she had never used a mix that she used the recipes in the book that came with the bread maker. This led to a new issue - did we have the book? Silent Sam found the book in his stash of instruction books. I have now made bread several times. (Probably tying the number of times I had made it in the past.) The results have been good. In fact, I made the Garlic-Herb bread last week. We agreed that we will only make that occasionally because IT WAS REALLY GOOD. It did last several days but I was careful wrapping it up. I wrapped it in saran wrap and put it in a container. In case you don't know, without any preservatives, the bread does not last long. It dries out quickly and gets stale. In checking the recipe, it looks like one serving of the bread is about 34.5 carbohydrates. Depending upon the rest of the meal, that is not bad. And it is very tasty. If you have a "plant stand" hidden away in your house, you might want to bring it back out and check out some recipes.